Provides steering input to help keep the vehicle in the middle of a detected lane and provides audible and visual alerts if the vehicle is detected drifting out of its lane. The LKAS is for your convenience only. It is not a substitute for your vehicle control. The system does not work if you take your hands off the steering wheel or fail to steer the vehicle. Do not place an object on the top of the instrument panel. It may reflect onto the windshield and prevent the system from detecting lane lines properly. The LKAS is convenient when it is used on freeways. 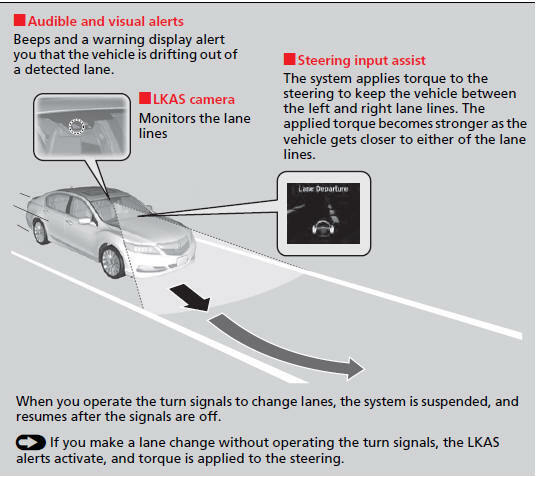 The LKAS may not work properly under the following conditions: • Your tires are over or under inflated. • Your tires or wheels are of varied size or construction. • Your vehicle’s suspension has been altered, changing the height of the vehicle. • Your vehicle has heavy load in the trunk or on the rear seats. • A compact spare tire* is mounted. • Driving on snowy or wet roads. • Roadway lane markers are difficult to see due to weather (rain, snow, fog, etc.) or road conditions. • Driving on a road with temporary lane markings. • Multiple or varied lane markings are visible on the pavement due to road repairs or old lane markings. • Roadway objects or structures are misinterpreted as lane markers. • On non-freeway roadways and on freeways with many curves.